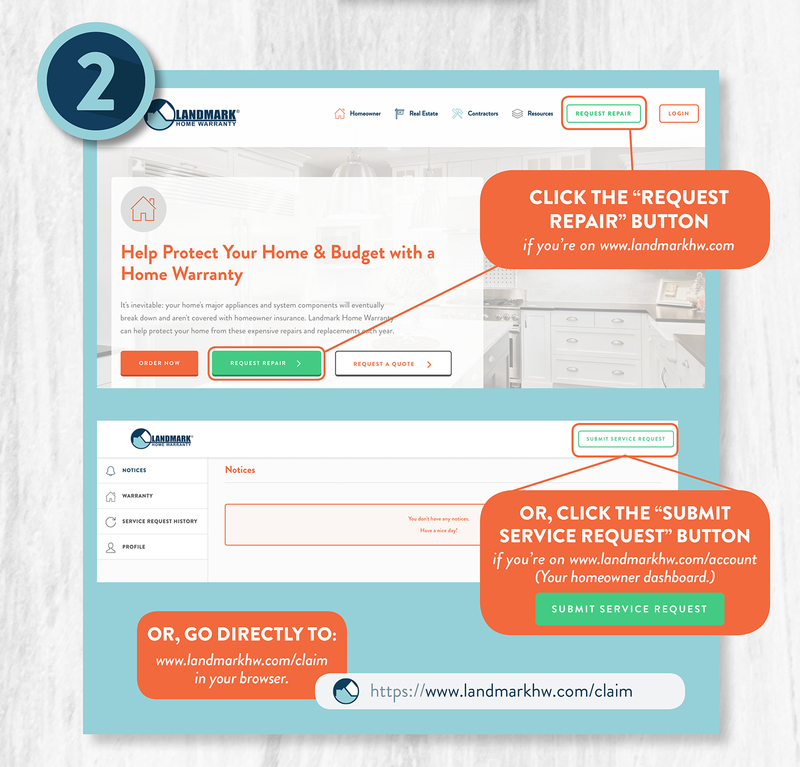 If you have a home warranty with Landmark, it’s important to be able to request service when you need it. During busy times of the year (usually in the summer), we can have higher wait times than normal on the phone. 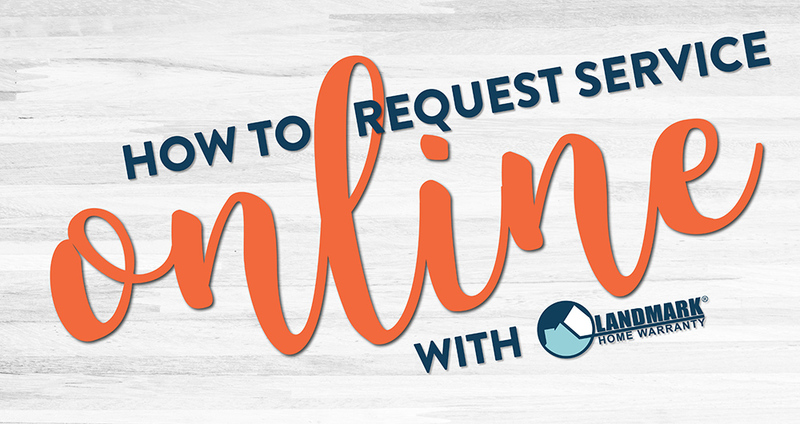 This is the perfect time to open a service request online! You can open a service request online at www.landmarkhw.com at any time, no matter the season. The process is quick, simple, and you don’t have to wait to talk to a representative on the phone. 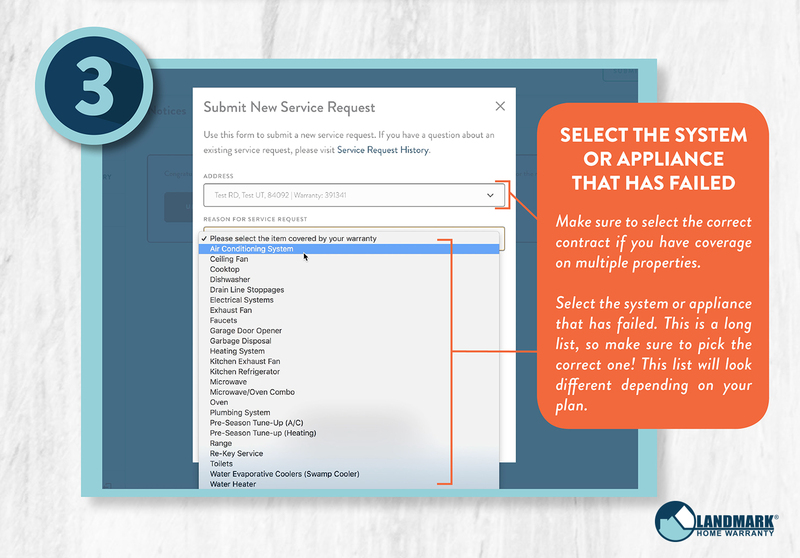 This video walks you through how to open a service request on Landmark’s website. While it is very easy to open a request, we have provided these step-by-step instructions below to help, just in case you have questions or get stuck. To begin, you have to make sure your contract is active! Unfortunately, you can’t request service on your home if you haven’t renewed your plan, you’re in the waiting period on a consumer contract, or if the contract hasn’t been paid for a real estate contract. As long as your contract is active, you can open a service request on our website. 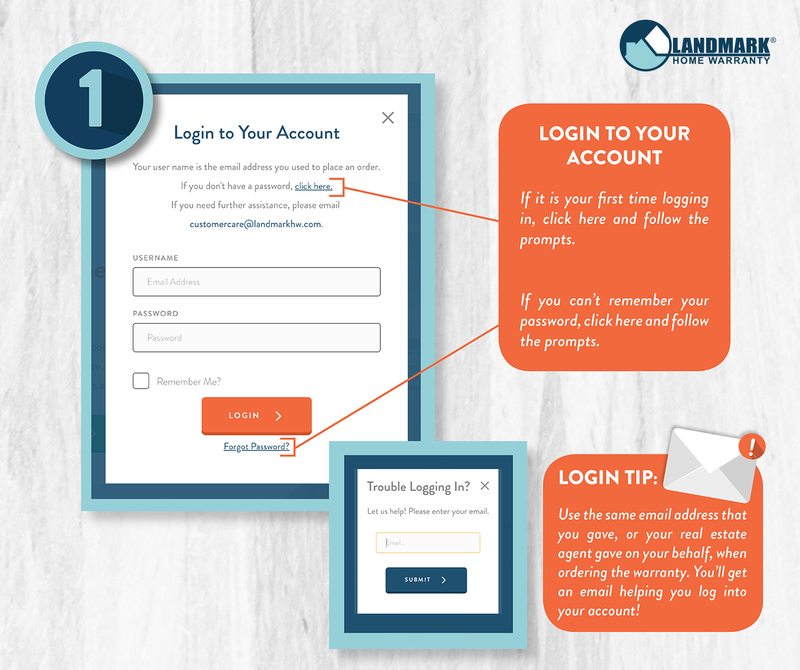 You will want to log in to your Landmark Home Warranty account online. You can easily get to this page by going to www.landmarkhw.com/claim. If you don’t have your login information, you can follow the prompts on this screen to get logged into the website. A box will pop up that asks you for your address. Select the correct address of the home where you need service. Then you will be asked the reason for your service request. Select the item that you need repaired or replaced from this drop down. There are many options, so make sure you’re selecting the right one. 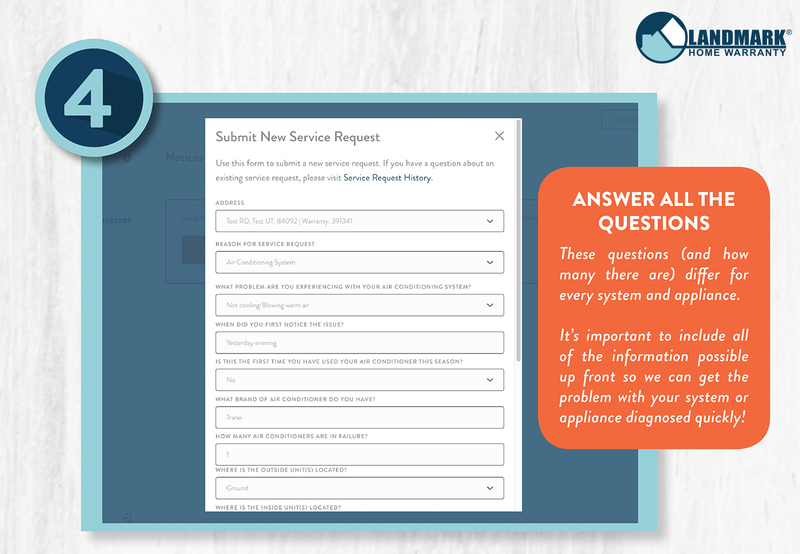 Answer the different questions for the system or appliance that you are having trouble with. Some of these questions are simple, like opening a request for a re-key. Others have more questions, like the model or type of the system or appliance, what issues exactly you’re experiencing with the system or appliance, how long you have noticed the problem, and so on. It is important to answer all of these questions as best you can so that Landmark can get you the correct contractor, and we have all the information possible about your repair or replacement up front. There may be some items that are not covered or may not be covered depending on the contractor’s diagnosis. Make sure that you read your contract to know more about what is and is not covered under your home warranty plan, and any limits you may face. Read and accept any clarifications, then click submit. 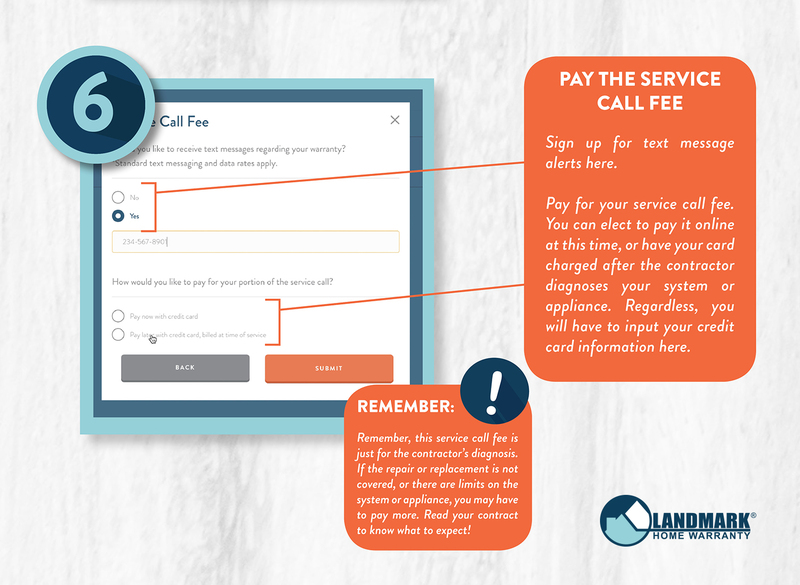 Finally, you will be asked to pay a service call fee. You will be asked to pay now or later. This fee is a charge for the contractor coming out to your home to diagnose the problem. If the system or appliance that has failed is covered under the home warranty contract and does not have any limits on it, this usually is all you will have to pay! If the problem is not covered under your plan, you can work with the contractor outside of the home warranty contract to get the system or appliance repaired. Input your billing information and press submit. You have just opened a service request on Landmark’s website! You will be sent an email with the assigned contractor for your service request. You will be able to contact the contractor and set up a time for them to diagnose the problem that works best for you. Usually the contractor will not be able to fix your system or appliance in that first diagnosis visit unless they have the perfect parts for the repair with them. They may have to order parts for the system or appliance repair, which will require them to come back at a later time. You can work with the assigned contractor to set up a time for them to come back and repair or replace the failed system or appliance. 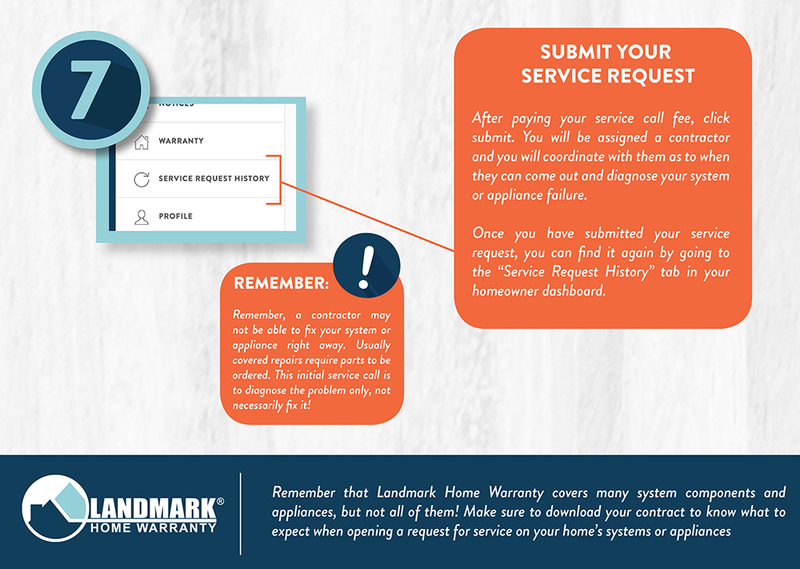 Now that you have experienced Landmark’s remarkable service and saved money on your repairs and replacements, make sure to renew your home warranty plan when the time comes! 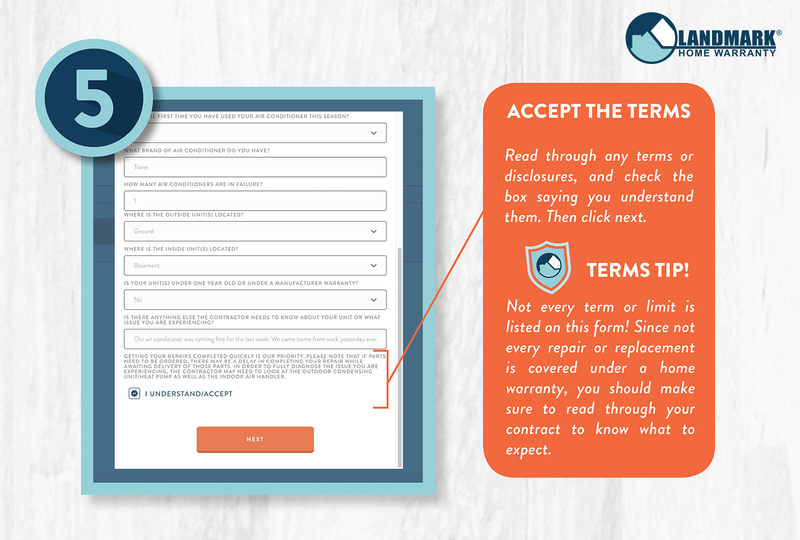 Go to How to Renew Your Home Warranty to go through the process step-by-step.